After having been reported missing about a week earlier, the bodies of Chicago hoodlums Paul “Needle Nose” Labriola, 37, and his partner James Weinberg, 53, were found in the trunk of a gold Pontiac on March 15, 1954. The two men had been selling protection insurance to tavern owners. Police felt that they had the Syndicate backing in their venture but then something went awry. Both men had been strangled inside somewhere and then their bodies crammed in the trunk. 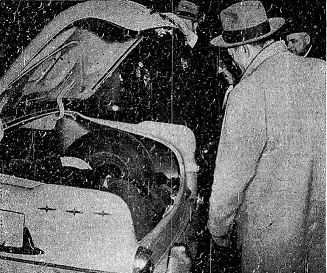 Both corpses were frozen so the police had a bit of trouble removing them from rear of the car. It shouldn’t have been a surprise that either man ended up in that trunk. Both were lifelong criminals. Labriola’s father was killed in a 19th Ward political feud back in 1921. His step father, Capone hoodlum, Lawrence (Dago Lawrence) Mangano was also bumped off, in 1944. So, what does this have to do with the Golden Age of Hollywood? Glad you asked. For that answer we must go back another twenty years and return to 1934 when the great American Crime Wave was in effect and the exploits of desperadoes like John Dillinger, “Pretty Boy” Floyd and “Baby Face” Nelson filled the headlines. Though the Depression years are synonymous with bank robberies and kidnappings, Hollywood elites were also targeted by hoodlums looking to make a quick buck. Of the two men pried out of the Pontiac, we are interested in James Weinberg. Back in ’34, he was running a small café in the Windy City but was already enmeshed in the Chicago underworld. On June 9, Lottie Zukor, wife of Paramount Pictures president Adolph Zukor, arrived in Chicago by train and checked into the Blackstone Hotel. She and her maid were going to spend a week in the city before being joined by her husband and son and heading out to Hollywood. They took a four room suite on the eighteenth floor. Not wanting to use the room adjoining her bedroom as an entrance, Mrs. Zukor left the key in the inside lock so that nobody could enter from the hallway. On June 11, the maid noticed the key was missing but failed to report it. The evening of June 13, found Mrs. Zukor attending a dinner party which would be followed by a trip to the World’s Fair. For the occasion Mrs. Zukor-who, as a young girl employed by a department store, worked at the World’s Fair in 1893 and would now be returning a millionaire-adorned herself with numerous articles of jewelry valued at about a million and half bucks in today’s dollars. At about four-thirty that morning Mrs. Zukor awoke sensing something wasn’t right. She noticed the light on in the next room and called out to her maid but received no answer. She reached for her watch to check the time but couldn’t find it. Glancing to the bed across from her, she saw that her jewelry was gone. The police dusted the room for fingerprints but found nothing. In fact no clue of any sort was uncovered. All Blackstone employees on duty were questioned but nobody admitted to seeing anything out of the ordinary. Afraid that the publicity might hurt attendance for the World’s Fair, the case was given high priority. Sergeant Thomas Alcock, a fifteen year veteran, was put in charge and was assigned a team of five detectives. Three of the men were assigned to the hotel lobby, each taking an eight hour shift with orders to pick up any suspicious characters or known hoodlums who might pass through. The other two detectives were sent to the World’s Fair to mingle with crowds and look for known jewel thieves. Alcock, in the meantime, visited the local pawn shops giving the proprietors both a description of the jewelry and a warning against trying to sell the stuff. As the days passed, hundreds of local underworld sorts were brought in for questioning but nothing was learned. The Zukors had had the gems insured for $65,000 and, through the Chicago police, the insurance company offered a large reward for the return of the items. Descriptions of the pieces and mention of the reward were circulated throughout the nation. Still nothing happened. Finally, on June 29, Alcock received a call from a lawyer stating that a man had contacted him regarding the reward for the jewels. It was decided to tap the lawyer’s found in hopes that the man called back. As this was happening, a U.S. Treasury Agent, working on different case, informed Alcock that he overheard a discussion regarding the Zukor jewelry during a tapped phone call with a notorious Chicago fence he was investigating. During the conversation the fence told the caller that the jewelry was too hot and that he should settle with the insurance company. After this, the lawyer received another call but when it was suggested that they meet in person the caller hung up. The caller was James Weinberg who was already under indictment in the case that the Treasury agent was working on. Detectives began to shadow Weinberg and a tap was placed on his phone. On July 16, two squad cars pulled up in front of Weinberg’s apartment and Alcock lead the raiding party inside. Within a few minutes they retrieved the jewelry. Weinberg, his wife and another couple were arrested. Though his wife actually had a record in St. Louis and Kansas City for hotel burglary, in the end Weinberg was the only one that would go to prison for the theft. He said that two young women left the jewelry in his café and he held it for a few days to see if they would return for it. When they didn’t he tried to claim the reward from the insurance company. No one believed him and he was shipped off to prison. If Weinberg told the truth about how the jewelry was stolen, it never made it to the press. Weinberg was released in 1940 and headed back to the Chicago underworld. As was mentioned his career culminated with his being garroted and shoved in a car trunk like a spare tire. Lottie Zukor fared much better. 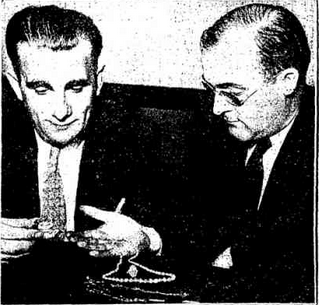 After Weinberg’s trial, she got her jewelry back and continued with her life as the wife of a Hollywood mogul; traveling with her husband both in America and abroad. As a member of over thirty philanthropic organizations, she dedicated a lot of her time to charity work. She died on April 7, 1956 at the age of eighty leaving behind her husband, two kids, five grandchildren and four great-grandchildren.